With Thanksgiving less than a month away, I though of pulling a few of the last year’s recipes to set the mood. This time is my favorite time of year, filled with great comfort foods: warm, full of spices, filling. When the temperatures begin to drop, my craving for root vegetables grow. Roasted beets or turnips find their way into my meals. Having grown up in Russia, where plenty of root vegetables are consumed year-round, I never had to develop a taste for them. In fact, I never had to hear my mother say “Eat your vegetables!” to me – it was more like “Eat your meat!” In America, I learned, in school, that liking beets was a very uncool thing. It painted me as a borscht-belt immigrant with her weird foods. Chicken nuggets were in, root veggies were out! Surprisingly, carrots were not as uncool as their other earthly cousins. Carrots, smothered with dip, were acceptable. My first encounter with a crudite left a sad impression as carrots sticks lay side by side with celery and tomatoes, all dried up and bent out of shape. The irony was that I hated cooked carrots. As a little girl, I had to eat a lot of tzimmes, a traditional Jewish dish with cooked carrots, honey, raisins and cinnamon. It sounds good to me now, but back when I was a tiny, wee thing, I dreaded the dish like the plague. As I got older, I grew to love cooked carrots and even crave tzimmes now. But that recipe will be saved for another day. Perhaps when Passover hits and I need to contribute to the Jewish cooking ideas. The spiced, glazed carrots I made for Thanksgiving last year, my favorite holiday, were a hit with everyone at the table. Even the self-proclaimed vegetable haters. Not only did they taste good, but they looked quite pretty with their green tops decorating the platter! 1. In a small bowl, whisk together the molasses, syrup, ginger and the spices. 2. 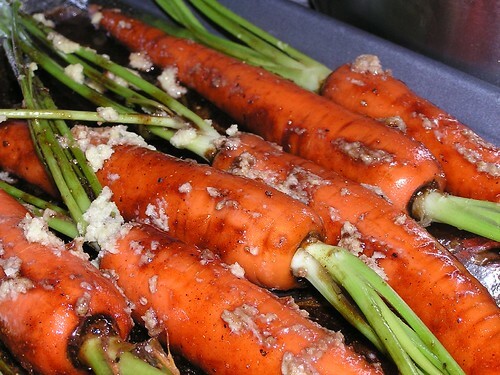 Spread the carrots onto an oiled cookie sheet. 3. Brush the glaze over the carrots, be sure to be generous. 4. Bake in the oven at 350 degrees Farhenheit for 20-25 minutes. What you are looking for is for carrots to be slightly firm – you don’t want to be eating mush. 5. Toss the carrots with cilantro and pomegranate seeds in a medium bowl and serve. The carrots are also delicious chilled as well as warm. A friend used mint instead of cilantro, but in that case, I would remove the pomegranate seeds to avoid conflicting tasting notes.